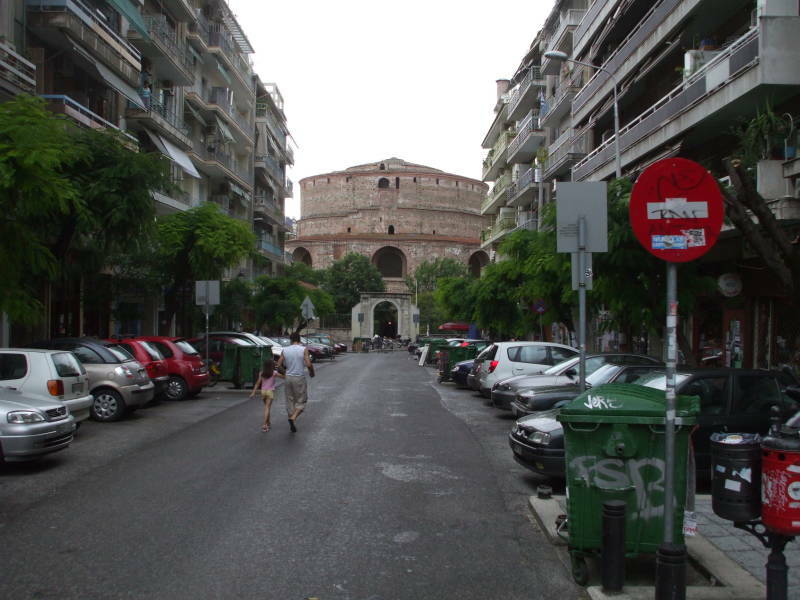 Thessaloniki has a long history, just like the rest of Greece. However, its history is a little different because it is far to the north of the rest of Greece, on the ancient (and not so ancient) east-west routes. This page is also part of the Athens to Paris by Train series, start at the beginning to get the background and the details so far. Attic Greece, around Athens, is quite a way down a mountainous peninsula, and the Peloponnese is across the narrow Isthmus and even further away from the main routes through southeastern Europe. However, it's easy to travel to Thessaloniki. There are frequent trains to and from Athens, and even a daily train to İstanbul. Thessaloniki is at the north end of the Aegean ferry network. Start planning your trip! You can use the below search engine to research schedules, and you can even buy your ticket online. The city was founded around 315 BC by King Cassander of Macedon. He named it after his wife, Thessalonike, who was the half-sister of Alexander the Great. The Kingdom of Macedon fell in 168 BC, and the city became a city of the Roman Republic. This led to its growth and importance as a trading center on the Via Egnatia joining Europe and Asia. The Rotunda was built in 42 AD, intended for use as the mausoleum of the Roman Emperor Galerius. It was converted to a church under Constantine in the early to mid 300s. The minaret dates from the long period of rule by the Ottoman Turks, when most of the churches were converted to mosques. Rome faded from prominence through the 300s as Constantinople became the seat of power and culture. Thessaloniki was more and more a city of the Eastern Empire, controlled from Constantinople, and becoming more Byzantine Greek and less Roman. The Fourth Crusade in 1204 was a pretty terrible episode all around. Constantinople was beseiged, captured, and sacked by western European armies who couldn't be bothered to continue on to the western Mediterranean shore to find people who were different enough in culture and religion to justify fighting. Thessaloniki and its surrounding territory was set up as the Kingdom of Thessalonica, the largest fief of the Latin Empire, a western European government set up in Constantinople in the wake of the Fourth Crusade. This Kingdom of Thessalonica was ruled by the Despotate of Epirus between 1224 and 1246. For much of that, from 1230 to 1246, it was also a vassal state of the Second Bulgarian Empire. 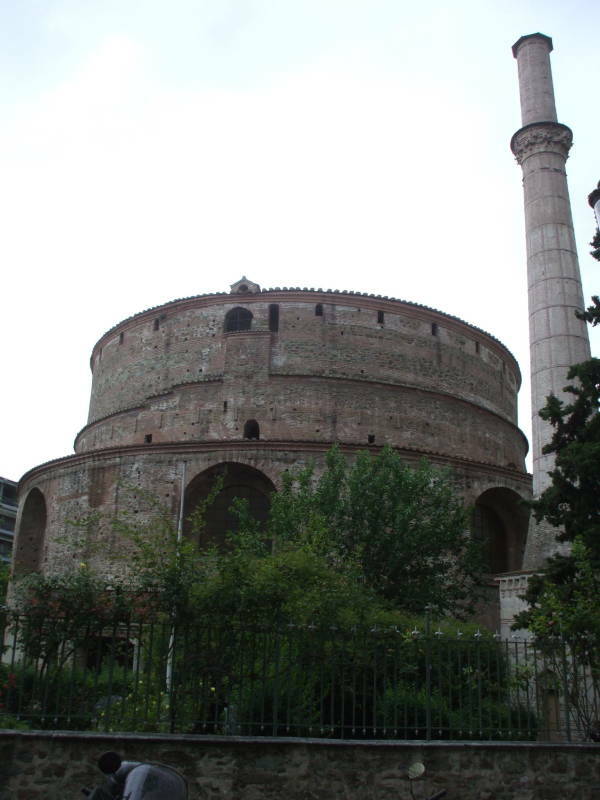 The Byzantine Empire recovered Thessaloniki in 1246. The Despot Andronicus was in charge of the city in 1423. He handed it over to the Republic of Venice in the hopes that the Venetian control would protect the city from the Ottoman Turks. That did not work out. The Ottoman Sultan Murad II captured Thessaloniki on 29 March 1430, with a brutal massacre and enslavement of the population and a plunder of the city. But after that it was, as was common under Ottoman rule, a situation of relative tolerance and personal freedom. The population in 1478 was 4,320 Muslims, 6,094 Greek Orthodox Christians, some Roman Catholic Christians, and no appreciable number of Jews. Just over 20 years later around 1500, those numbers had grown and shifted to 7,986 Greeks, 8,575 Muslims, and 3,770 Jews. By 1519, the Jewish population had grown to 15,715 and was 54% of the city's population. The growth in the Jewish population was the result of Spain's rulers Ferdinand and Isabella expelling all the Jews from Spain, and the Ottomans inviting them to move to Thessaloniki (or Selânik as the Ottomans called it). Selânik, which came to be known as Salonika, was the capital of an Ottoman sanjak until 1826, when it became the capital of Selanik Vilayeti, made up of the sanjaks of Selanik, Serez, and Drama. It became a stronghold of the Janissary forces of the Ottoman Empire. It fell out of Ottoman hands on 26 October 1912, and then things get a little confusing through the Allied expeditionary force landing there in 1915, when it was a base for Allied operations against pro-German forces; and the various stages of the establishment of the modern Greek state. Thessaloniki was held by the Germans from April 1941 through October 1944, during which many of the city's Jews were deported to Germany's concentration camps and slave labor camps and almost all of them were killed. About 96% of Thessaloniki's Jews of all ages were killed by the Germans. After a peak of about 62,000 Jewish citizens in 1902, today only about 1,000 remain. 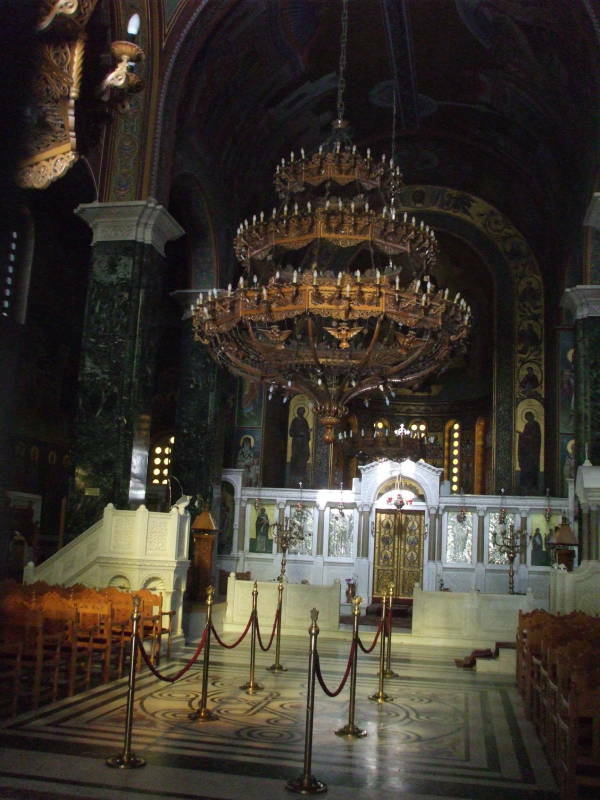 Here is a typical Greek Orthodox church interior, near the Apsida Galeriou or the Arch of Galerius. The nave is the temple proper, its name coming from the same root as naval, functioning as a "ship of souls", its keel shaped vaulting in western churches further emphasizing that terminology. As in all Orthodox churches, there are no pews and just a few seats. 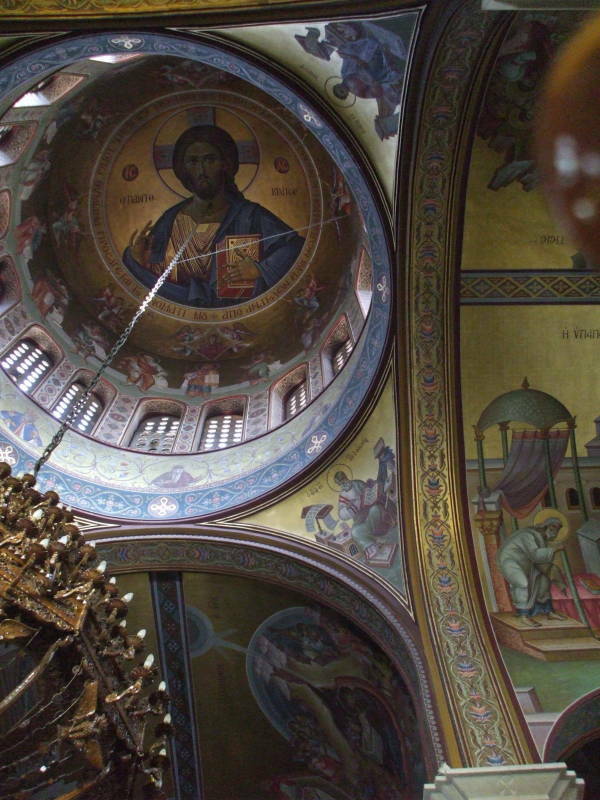 Overhead in the dome above the center of the nave is a painting of Christ Pantocrator or Χρίστος Παντοκράτορ, Christ the Ruler of all of creation. An iconostasis divides the nave from the sanctuary or high altar area. The Aghia Sophia cathedral we see today dates from the 700s. That's the present structure, there was a church on this location as far back as the 200s. Its design is based on that of the Aghia Sophia in Constantinople, today's İstanbul. The floor plan is that of a basilica in the shape of a Greek cross, topped with a dome. The name is also the same: Αγια Σοφια, meaning Holy Wisdom. These churches are not named for some "Saint Sophia". But it happened that "Sophia", Greek for "wisdom", because a popular woman's name, including a few women who became designated as saints and led to further confusion. The first word, Αγια, gets transliterated into Roman spelling in many different ways: Agia, Aghia, Hagia, Haghia, and so on. The Turks spell Αγια Σοφια as Aya Sofya, which is probably closer to the actual Greek than the typical westerner's pronunciation of the transliterations used by English speakers. 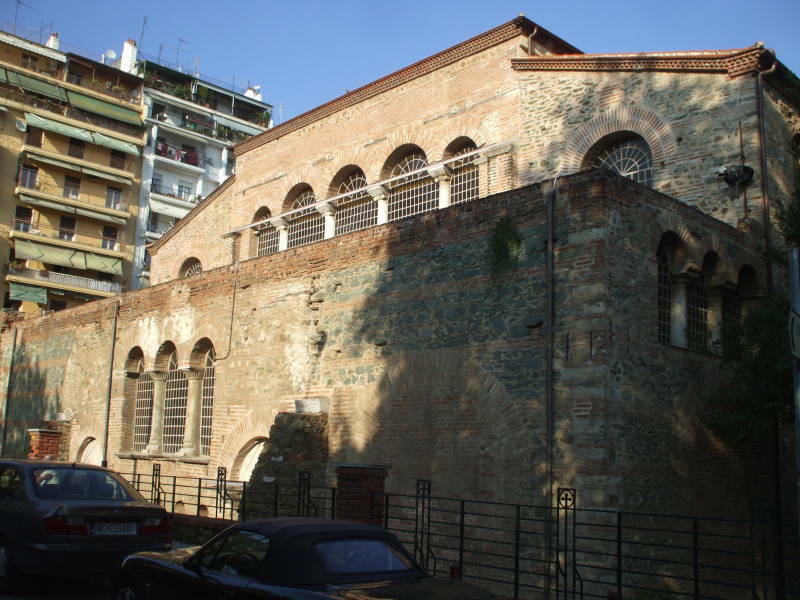 The Panagia Acheiropoietos, or the Church of the Virgin, is probably the earliest surviving church in the city. Its bricks and mosaics have been dated to approximately 450-470. Panagia Acheiropoietos, or the Church of the Virgin. It was known as the Panagia Theotokos during Byzantine times, dedicated to the Θεοτόκος or Theotokos (God-Bearer), the Virgin Mary. The more recent name of Acheiropoietos ("not made by hands") dates from 1320, referring to a miraculous icon housed here. Being so old, it is of quite plain design. Three aisles, separated by rows of columns supporting a wooden roof. The surviving decoration is primarily the columns and their capitals. 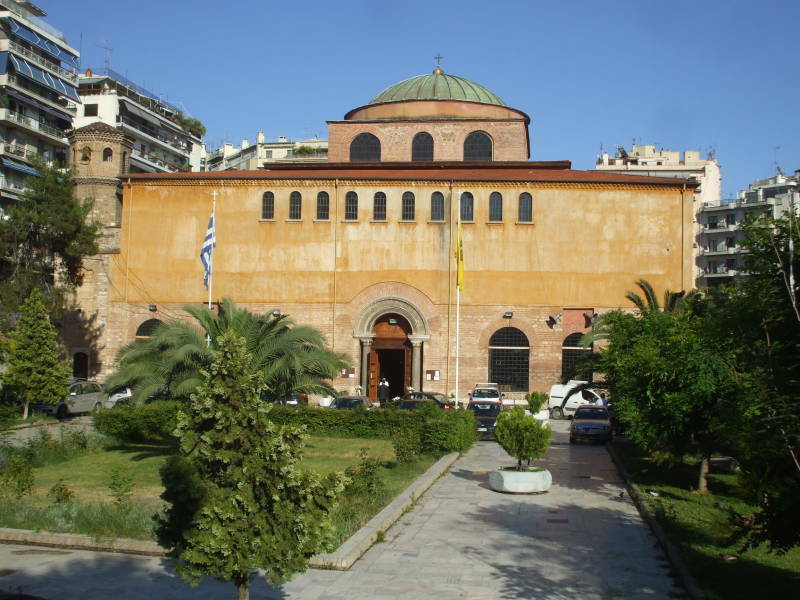 The Cathedral of Aghias Dimitrios is the main church dedicated to the patron saint of Thessaloniki. The first church on this location was built in the early fourth century and replaced a Roman bath. The bath was said to have been where Demetrius was held prisoner and executed. The church burned and was rebuilt a number of times until a five-aisled basilica was built in 629-634. What we see today is mostly that 7th century basilica. 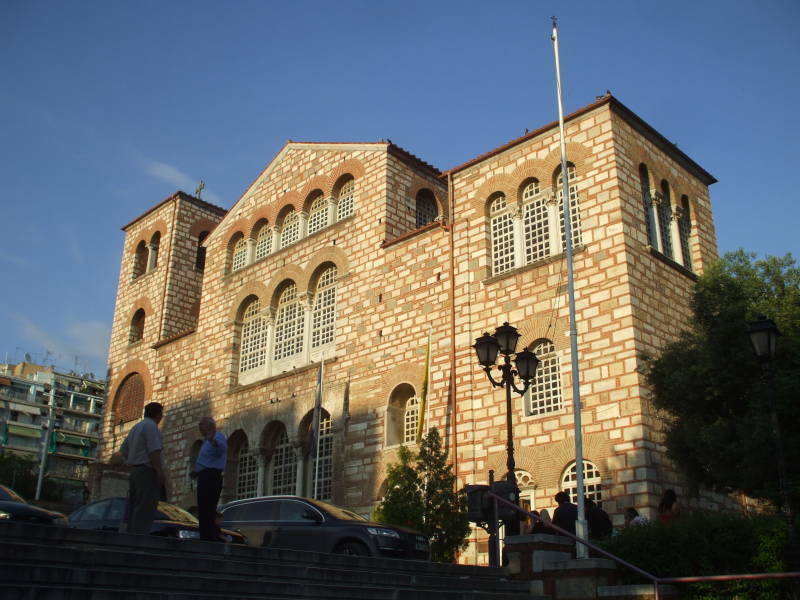 Cathedral of Aghias Dimitrios in Thessaloniki. I can make no promises, but you might get to see the church in action. We have slipped into the rear of Aghias Dimitrios during an opulent wedding. 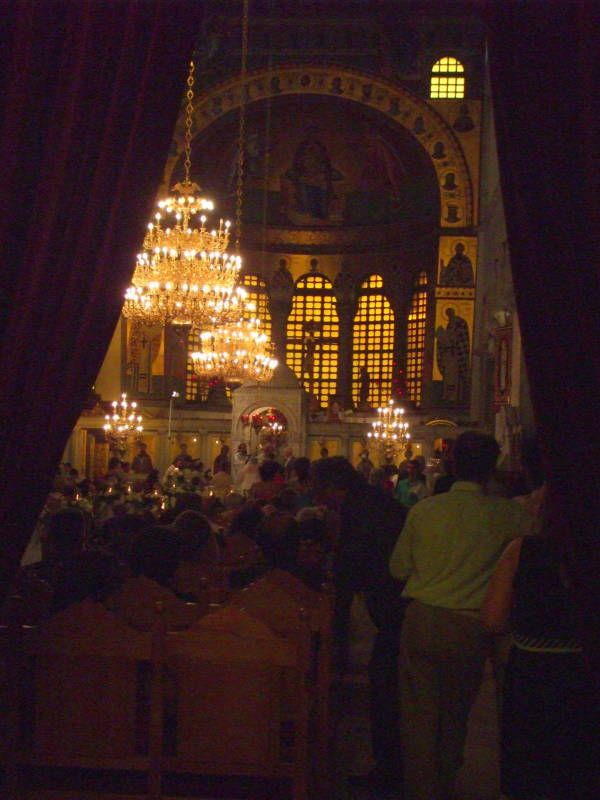 Interior of Aghias Dimitrios church during a wedding. 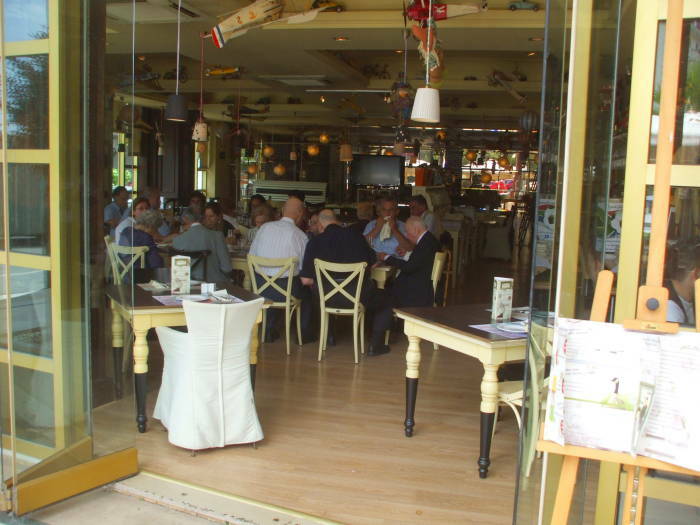 Platea Aristotelous is in a very prosperous area at the center of Thessaloniki. The south end of the square is open and faces out into the harbor. The other end is semi-circular, lined with some of the finest hotels and restaurants in the city. 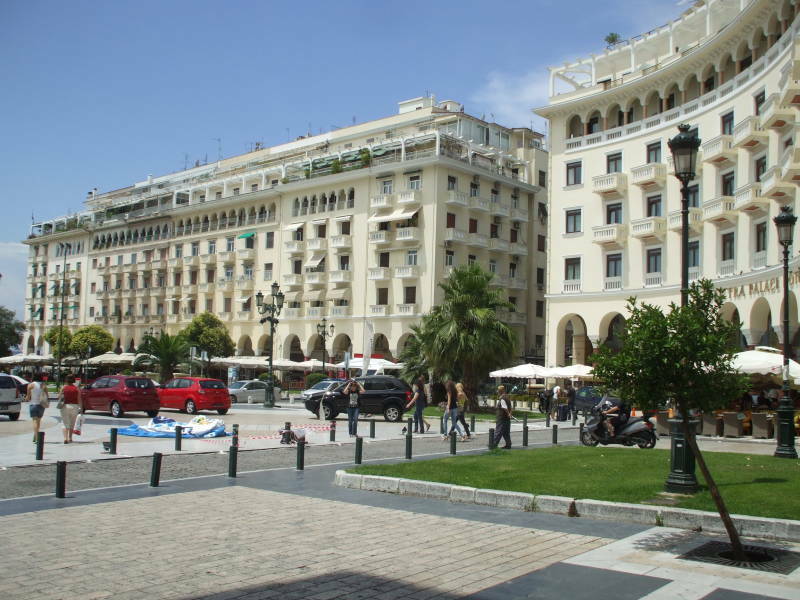 Elegant hotels around Platea Aristotelous in Thessaloniki. A nice restaurant in one of those hotels. If you are following the Athens to Paris rail trip, the next stage is an overnight sleeper train from Thessaloniki to Sofia, Bulgaria. Otherwise, pick another Greek destination below.